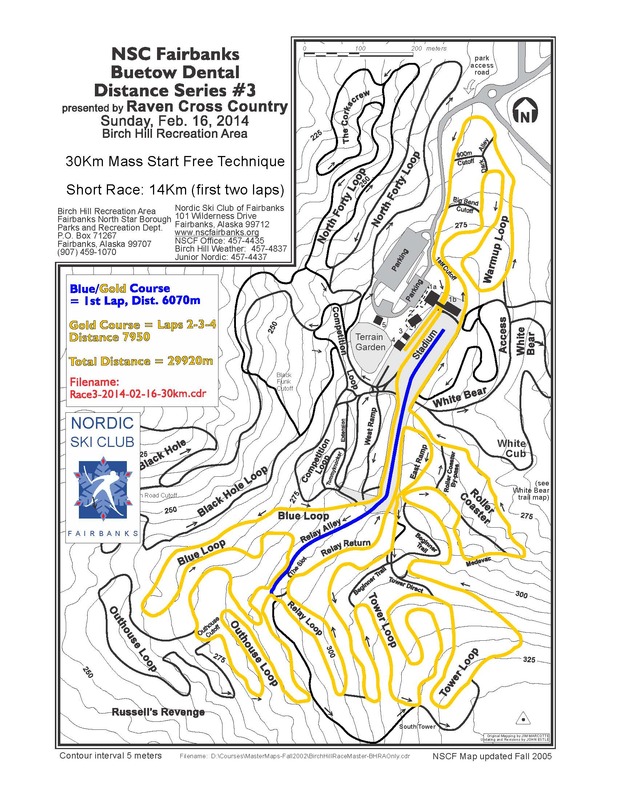 Unlike Sochi, where the Olympic cross country skiers are dealing with tropical conditions and deep slush, we will have firm trails with deep natural snow for Sunday’s third Buetow Dental Distance Race, the Raven Run. Anticipating rather cold temperatures, John Estle, Nordic Ski Club of Fairbanks Competition Director, has selected the warmest, flattest course possible at Birch Hill Recreation Area. The 4-lap course gives skiers a 14 or 30 km option. In spite of the flatter course, classical skiing may be a faster option than skating for most skiers given the possibility of some delightful hoarfrost snow before or during this event. However, this final race in this season’s Distance Series will be a good endurance workout with the Sonot Kkaazoot a little over 6 weeks away. Also, you need to race to be eligible for the post-race drawing of valuable ski equipment and supplies from Raven Cross Country. Reminder to the procrastinators out there, the Sonot Kkaazoot early registration ends in two weeks. Make the commitment now and save some money to use on the post-race celebration. This entry was posted in 2014 Sonot Kkaazoot information, Training Ideas and tagged Birch Hill Recreation Area, Buetow Dental Distance Race, Nordic Ski Club of Fairbanks, Raven Cross Country by Sonot Kkaazoot. Bookmark the permalink.